An old dead tree fell onto a car on our street. 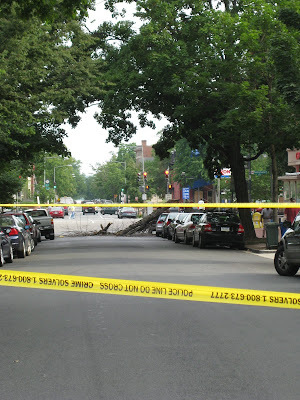 It took an entire afternoon for DC to clean up the mess they could have prevented by simply removing the old dead tree in the first place. Apparently quite a few neighbors had asked for it to be taken care of prior to this incident. 1. It wasn't our car. 2. Because of the road being closed the street cleared out and we got a great parking spot. 3. If this is the only excitement we get on our block, we can live with it! Fun blog! Thanks for visiting mine. If you ever start a blog on event planning tips like you mentioned, let me know and I'll post the link on my blog! I am in the development phases...and still trying to think up a name! I will keep you posted.